17. Mary Piercy. 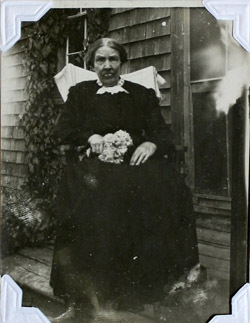 Daughter of George Piercy & Ann Winter. Born 8 May 1831 in Wark Common, Northumberland, England. Died 12 Aug 1916 in Harvey Station, NB. Buried in Harvey Settlement Cemetery. Religion Presbyterian. She married Patrick Turnbull Grieve, son of William Grieve & Eleanor Turnbull, 1 Jul 1851 in St. Paul's Church, Fredericton, By Rev. Dr. John M. Brooke. Born 15 Feb 1824 in Peels, Northumberland, England. Died 25 Nov 1860 in Harvey Settlement. Buried in Harvey Settlement Cemetery. Occupation Farmer. Religion Presbyterian. Marriages 1851-55, #F15552, p. 37: Patrick Turnbull Grieve to Mary Piercy on July 1, 1851, by John M. Brooke, witnesses William Grieve Jr., and Alice Bell Grieve. Undated photograph of Mary Piercy (b. 8 May 1831, Wark Common, Northumberland, England, d. 12 Aug 1916, Harvey Station, NB). Source: Jocelean Swan Hall, 27 Jul 2006. Patrick and Mary's youngest child was born three months after Patrick died, leaving Mary to raise seven young children on her own. Patrick was a farmer. He held title to Lot E, in Block 30, containing 100 acres on the eastern bank of the Magaguadavic River with Pratt Brook running through the lot. This lot was granted by the Crown to Patrick in 1853. Indenture No. 14361, dated 17 Jan 1859 shows that Patrick sold this lot to his father. In his father's Will, his father bequeaths this lot to Patrick's wife Mary. Indenture No. 32756, dated 23 Nov 1882 shows Mary sold this lot that she had inherited from her father-in-law to George Grieve, who was then a railway employee. It is believed that this was her son George A. S. Grieve.